You were doing your part to bring people together and heal the world. That’s really how healing works. We heal by loving each other and leading by example; showing people what is possible when we love each other just as we are and not only recognize our differences but celebrate them and look at how we can use them together to make us jointly better than our separate parts. You were doing your part celebrating each other based on skills, talent and a joint vision without regard to color and religion. You were doing your part and we were doing ours. We showed up cheering and groaning together to as one. We talked in the concession lines and commiserated and celebrated our team together. Did it ever occur to you that you and we were already a mix of backgrounds, races and religions? We were already living the dream you want, right in front of you. Your desire to focus on division and anger has shattered what many people loved most about the sport. Football was really a metaphor for our ideal world –different backgrounds, talents, political beliefs and histories as one big team with one big goal - to do well, to win, TOGETHER. It was simple – we loved you and you loved us – with all of our races, religions, different backgrounds and politics. Simplicity in a crazy world was pretty awesome. If you ever want to get off your knees and get to work on building bridges, let me know. I have found screaming about the problems in service marriages or even standing in silence in front of them, hasn’t healed even one of them. On the other hand, funding the Chris Kyle Frog Foundation, building a team and rolling up my sleeves to get in the trenches during my “off time” -volunteering there outside of my paying jobs - has proven to make real change. You have a lot of strong guys, I am sure in the off season a lot of them could build some pretty big bridges if they care enough to do the hard work. That would involve getting off their knees and getting to work though. I can do it while I raise two kids as their only parent and work through the greatest pain of my life, let’s see if they can do it for the issues they say they care so much about. I’m sure a lot of people will have some strong reactions to this letter. Based on the comments, many already have voiced their opinions, with some supporting her remarks, while others disagreeing quite strongly. Yes, football has been politicized. The Rubicon has been crossed. Yet, is this the hill to die on to make a political point? It doesn’t matter about free speech. Of course, free speech matters, but fans don’t see it that way. They see a bunch of players spitting on the American flag, disrespecting those who serve in uniform—and those who have left the service in defense of our country. That’s what they see. If you’re explaining, you’re losing—and the Left is doing a lot of explaining right now; why this isn’t about disrespecting the flag, our troops, or being unpatriotic. The fight is over on that front. You lost—and now as you double down, you’re only making things worse. You could have tweeted after the game about police brutality, racial inequality, or whatever was on your mind. Perception and optics are everything. You decided to go out to respond to Trump and got kicked in the teeth. Just like the Democrats and the media are kicked in the teeth constantly by overreacting to anything this man does. You're athletes, not politicians, I get it, but by taking a knee in response to Trump, you’re stuck in the whirlpool now. And the fans, the American people, are not going to let you off that easy. Maybe we can go back to when we could watch football without this nonsense. 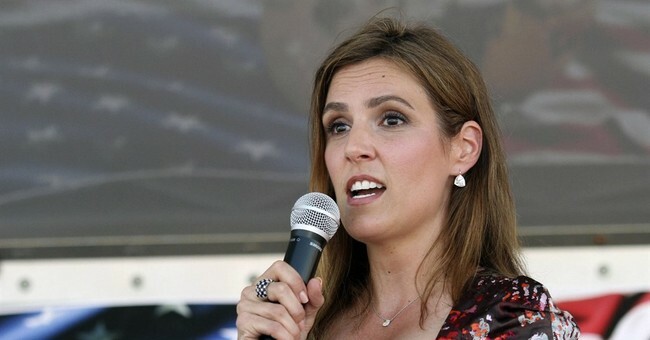 That's Taya Kyle's hope. We'll see what happens.